put my whole acquired knowledge of human figure drawing and portrait drawing in a final polished pixel art sprite illustration. V3: Changed eyes, lips, eyesockets, face shading and improved the overall cluster placement/sharpness of the face. V4: Another face/skin edit. Mainly changed the tilt/perspective of the head plus a lot of small details. Wow, this is so much better! @jtfjtfjtf: really liked what you did there with the eyelashes, wasn't a particularly big fan of blurring/softening the eyes themselfes. Thanks for the input, it definitely gave me a fresh view. This version looks much better. Good job. I tried doing some of things I mentioned as A, B, and C. Softening the age lines and making the eye areas less severe while also maintaining the anatomy (lips are bigger). The old version definitely looks anime-like with the big eyes and button nose. Point D definitely speaks to that when I was comparing the two. Is it okay if I do an edit to V3? yeah you are right. Completely forgot about moving the ear. That's done now as well a I show some skin there what makes the hair better. Nearly Anime styles always look young and babyface like. There are a few exceptions with some western influences which use smaller eyes. Those are usually the ones I prefer from the overall style. But I also guess the slightly smaller eyes work better with the more realistic shading. compared to completely realistic proportions the eyes are still huge. I disliked the old chubby nose of tkhe 2013 version, because in terms of cluster placement it looked harsh and gave it more of a cartoon impression. I think you have to move the ear up now, since she's tilting her head. 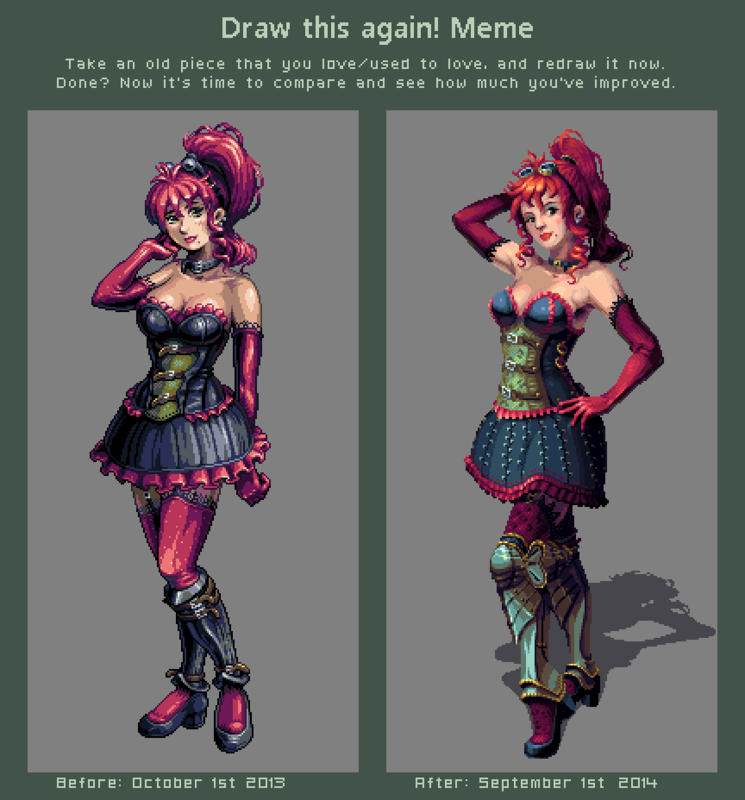 With the last version (I think version 3) there were a few things making her look like an older version of the previous sprite. A) Age lines around the face. They were very subtle but slight lines indicating eye bags, laugh lines, the nostril/cheek divider all added age. B) Sharp eyebrows. These make the character look more mature and less young/playful. C) Sharp eyelids/low eyelashes. These also reinforce the more mature/severe, less young/playful look. D) Not as bright/smaller eyes. More adultlike and less youthful (big eye) look. I'd also say the bottom lip looks less plump and there's also the straight nose bridge instead of the button nose compared to the original character. Not necessarily things that make her look old, just different. not really. Her age hasn't changed, it's more that I have/had difficulties with doing the face. With version 4 I am quite happy. Guess she also looks a lot younger now compared to the earlier versions. Is she supposed to be an older, age-wise, version of the character? problem here with the face is that the style is innovative and I have no experience values how to solve stuff within this style best. So it's a lot of trial and error and putting that against an old version which got a lot of input over at pixelation back then. It's not that the old one is better, but it was indeed much more expressive, where facial features are concerned. Very relatable. This one, although inmensely superior in technique and it's new style, feels a tad too much uncanny valley'ish. Not to mention her personality took a full 180° turn into something completely different. I find it interesting how many see the old as 'better'. The old one looks more like it fits in a video game sure, due to outline and shading/coloring style, but overall I think the new one is much better, objectively, in terms of technique, anatomy, realistic shading. Good work but old better. Is she smiling? Looks like the face I do when I fart. All pixels aside, I really dig the more natural pose. Might not be a biggy but it makes the whole feel more natural in addition to the style changes. @Rayovatron: I think I got what you mean. I went one more time over the secondary facial features (cheeks & jaw). Added a list in the description and a gif for a better illustration of the changes. A great improvement in a relatively short amount of time, especially for someone of your skill level/experience. Very nice job. It looks much more realistic but the visual clarity has dunked a little. I would suggest adding outlines and to exaggerate the lighting on some of the features for more contrast. Amazing shading and color choice. the gloves, the vest and the hair are my favorite parts... damn! I like the old one better. her body is great but the face idk she looks like 40yo with too much makeup.